Free domains like .tk, .co.nr, .co.cc etc are present all over the internet, also they look attractive for most webmasters. But are they legit or a scam and really worth? So finally you have got a blog. You have enough data to share. But you don’t like a me.blogspot.com or a me.wordpress.com address. It hurts your ego much because you feel that you are under someone. No one likes dominated right? So then, you want to throw your sub-domain and get a domain. But you are either too poor or too miser to spend. So you open the best tool on the internet, and type two golden words : free domains. And lo! You are amazed by the plenty of free things on the internet. Relax. You haven’t got that far yet.Speaking of free domains, I have personal experience with two of them. One is .co.cc and another is .tk. Of the above list, a .tk domain looks the best, because it doesn’t has a .co tag attached with it. People will have to type less to reach your site. Also it looks good for technology blogs, because it sounds something like tech. But before plunging into getting one, just have a look at my story below. I got a .tk domain quite a few months ago, when my blog was new and I had chosen custom hosting because of the limitations wordpress.com gave. Now getting a good free host is another story, which I will discuss later. For that time, truly speaking, I was more than happy, so much that I even joined their ambassador program as a return for their gratitude. The site says that they give free domains to support poor people of Tokeleu islands. If you join their referall program and urge people to join their site, you will get a virtual currency called fish. With more fishes you accumulate, you can exchange them from gifts such as MP3 players, mouse etc. Good enough right? One thing that always irritated me is that though you have full control over the domain, including CNAME records, nameservers etc, you don’t get full ownership of the domain, unless you pay them If you have a .tk domain, you can check the whois to confirm this yourself. There is no free lunch in the world. When they give you a free domain, its natural that they expect something back from you. But that something was too unnatural to believe. Just 25 hits per month. That’s what my website used to get in a few hours, so I used to not worry much about that. 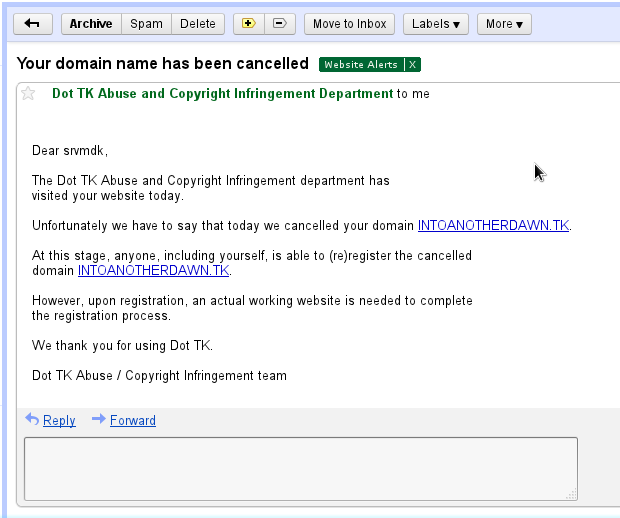 What worried me more is this blog post which says that .tk was a domain parking scam. For non-IT people, what does that mean? Well, in layman’s words, when you start a website, its natural that you will publicize it much over the web because everyone loves more and more visitors. This is mainly done by writing good articles, and giving the link over wherever you can. More you link pages of your site, more it improves search engine position because Google ranks sites according to algorithm that is much dependent on backlinks. Lower is your search position, its likely that more visitors you will get. 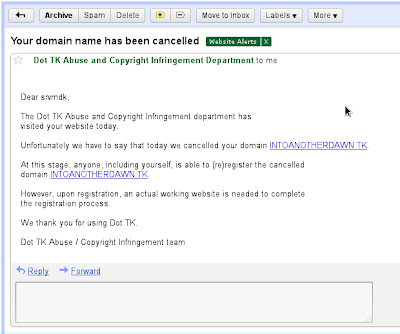 By parking scam I mean is that .tk people give you a free domain for using and publicizing. When your site is getting enough visitors and has got enough links, they sell it to someone who is hungry for free traffic. And sadly, you can do nothing about it. Because legally you are not the owner of the domain. At first, I didn’t believe it, as I am a normal human being who doesn’t believe things until that happens to himself. But over searching keywords like .tk scam I got more and more worried because of increasing number of complaints they have got. Also, I was a member of their Facebook group and after every few days, a guy used to come and complain for his rejected domain. I became cautious and number of links of my .tk site was increasing. What if they snatched my domain someday? My all hard work and visitors will go in vain. Finally one good day, I decided to switch to a standard .blogsopt.com address. Not cool enough but definitely more reliable. I bet you have a look in my sight once, you wont find any adult/copyrighted material. Even for images I have taken from somewhere, I always provide a backlink to the original site in the courtesy section. Now whenever I open my .tk site, I land up in a site which has got only adds and nothing else. So its quite proved that .tk is almost a scam, unless you pay them. Frankly speaking, I will better get a more popular domain that paying $6 an year for a .tk address. Next comes more free domains in the list such as .co.cc. It is banned by Google, because its believed that most of their sites host malware, so you cant expect search traffic (which comprises a good number of visitors) from them. For me, except for the banned fact, .co.cc domains are quite reliable. I have been using them for an email domain for over an year now (using Google Apps), and haven’t experienced much problem from them. The best of all domains according to me is a .co.nr address. But as far as I know, they just do URL forwards, so they cannot be termed as a real domain. Also, apart from this popular ones, you can have a search for more free domains on the net. But the real question is : are they really worth it? First of all for them, your site doesn’t look professional, and if you are getting quite a number of visitors per day, it never hurts to pay just Rs. 99 and get a .in domain. So my advice for you is : post good articles, gain a regularly number of visitors per day, and then buy a domain. It will definately help you in the long run. Next articleHow to Install Ubuntu 11.10 (11.04, 10.10) alongside Windows 7 and XP without losing data (dual boot). Good updates. Daily you are updating new things in twitter. It works great. Thanks for sharing. Nice article and very useful. Your domain was cancelled because you moved your website… If you could read the email, it says you can reregister anytime if you have a working website under it.